Friday, February 1st, 2008 | 10:43 pm	and filed in Music, Friends. I’ve been up in San Francisco for a couple of days working on the mixdowns of Goh’s album - which is now titled “Ulysses”. We’ve been at Tiny Telephone Studios where this project has taken an interesting twist. 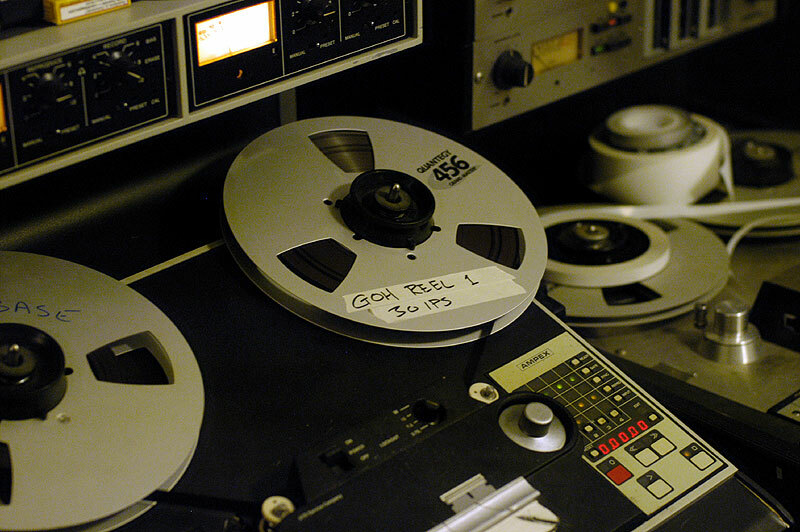 We’ve decided to bounce a majority of the tracks back to 24 Track tape for mixdown. Tiny Telephone specializes in full analog recording with a beautiful Studer and a Neve desk. Unfortunately this posed a potential problem for us: their pro tools system is equally as antiquated and we would be at the mercy of bouncing the hangar session (which were recorded through apogees) through the crappy mix 24 converters going to tape. The day before we went in, I was scrambling to find someone who could either lend or rent out a set of decent converters that we could use instead of the old 888 i/0s. Through some amazing luck, I was referred to Steven Jarvis of Area51 Mastering who had 24 channels of Genex converters that I was able to rent for a few days! Steve met us at the session and even teched the system to make sure everything was clocked properly and working. It took ages to get everything going, but finally we were running and managed to transfer most of the album to tape. We were working with Scott Solter who took the tracks and started shaping the mix into something completely different than what we originally expected - in a great way. The tape mixes had such a different feel from pro tools renders, and Scott gave us a “Bro Bounce” to 1/2″ 2 track which just sounded amazing. Ulysses seems like an apt title for this project. The production has been a epic tale taking us all over the place and meeting bizarre freaks who still align heads and splice tape. We will be back in March or April to finish things up - hopefully. The next adventure will be finding someone who will master this project.